Florentine Minchiate is played with a pack of 97 cards. The subjects and arrangements of the trumps are slightly varied and their number increased to 41 by the addition of the three theological virtues, one of the cardinal virtues (Prudence), the 4 elements and the 12 signs of the zodiac. The subjects of the last 8 trumps are relieved on a red background. 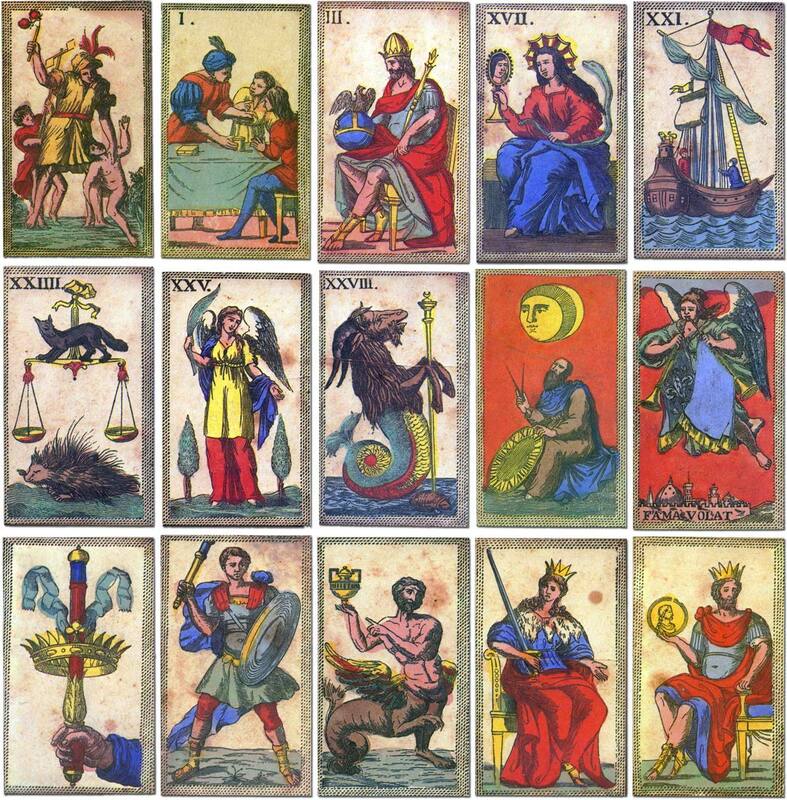 In the numeral cards the Cavalli are monsters with human heads and of the four Fanti two are warriors and two servants. Also the Spade and Bastoni suit symbols differ in form from those of the Tarocchi pack, the former being weapons of the conventional military pattern, crossed diagonally; and the latter short batons. These beautiful cards have an old world look and feel to them and are made of sturdy card stock (matte). The original etchings were painted by hand. Old cards manufactured in Italy usually had a fanciful decoration on the backs, the paper folded over to the front to form a border. Many modern decks still imitate this effect. 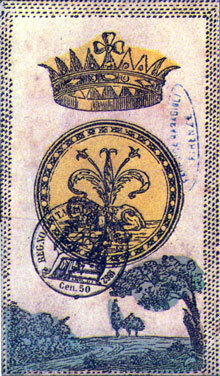 Above: Minchiate cards originally published in Italy in 1850 and published as a facsimile by Il Meneghello in 1986. Minchiate is an expansion of Tarot that most likely dates back to the sixteenth century. Minchiate differs from the typical Tarot deck by having 41 Major Arcana cards rather than 22. Like the Tarot, there are 56 Minor Arcana (16 Court cards, and 40 Pips), making a total of 97 cards in the deck. Card size: 3 3/4'' x 2 1/4 inches, 9.53 x 5.72 cm.